This is an obsessive compulsion, harmless, however I know the symptoms, I am bored, I need the rush. When a traveler enters a new environment, there is a rush; the initial excitement stimulates the brain to secrete endorphins. Once a person realizes how to push this button that allows the brain to secrete endorphins, a person may enjoy the feeling. When a person enjoys one reality more than another, they tend to seek that reality. Natural painkiller: a substance in the brain that attaches to the same cell receptors that morphine does. Endorphins are released when severe injury occurs, often abolishing all sensation of pain. Note, a person is capable of choosing socially acceptable ways of inducing the brain to secrete endorphins, when the dysfunctional mind takes over they choose negative choices because it is quicker and easier. 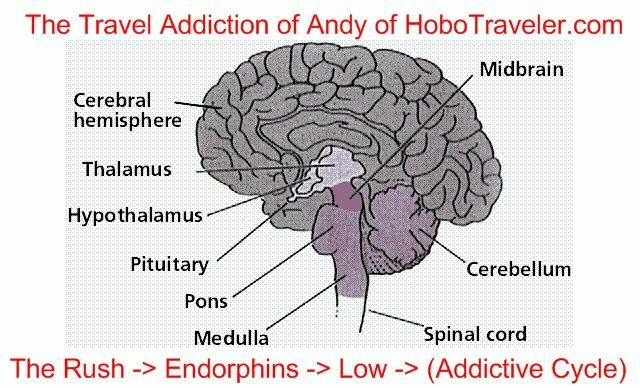 I believe all people are endorphin addicts, some choose acceptable ways of medicating like travel and others fight with the boss. Funny, I am about to cross the border into Rwanda with 1000 dollars on me. Fear almost allows me to not need to travel.